Bluetooth Remote allows you to use your phone as a remote control for audio or video players using Bluetooth. 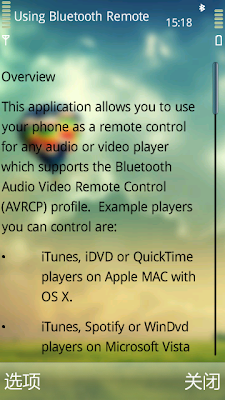 It will control any device which supports the Bluetooth Audio Video Remote Control (AVRCP) profile. Suitable audio or video players are: iTunes or QuickTime players on Apple MAC with OS X, iTunes, Spotify or WinDvd players on Microsoft Vista or Windows7 with Bluetooth.